Need Vizio Soundbar Remote Codes? If you have a Vizio Sound Bar and want to control it with a universal remote control or your Cable or SAT remote, we have the codes needed. A Vizio soundbar can be controlled with any universal remote if you have the correct programming guide and the correct remote codes for the sound bar. If the codes below do not work with your Vizio sound bar, please leave a comment below with the model number of your remote control and the model number of your SB and we will find you the correct remote code or programming method. Program your universal remote control to a VIZIO Sound Bar. Use the following 4 and 5 digit remote codes. Some sound bars can be programmed to accept other IR to control them. Apply the TV volume IR into the Vizio SB. 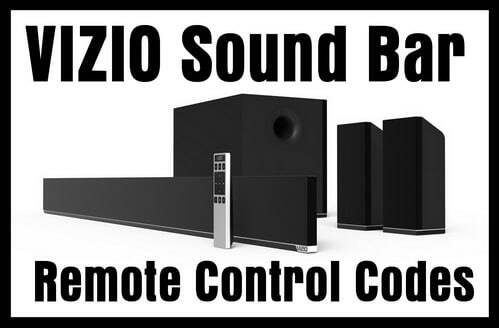 All codes reported working with the Vizio Soundbar VSB200, SB3820, VSB201, VHT215, S3821. These codes have been tested with the Comcast remote controls, Verizon Fios, Xfinity X5 remote, Uverse, U-Verse, S10-S3, S10-S4, Atlas 1056B03, etc. If you use Verizon Fios, there is a Key Fix. 1 – Press and hold the OK and * buttons at same time. The Red LED will blink twice and then stay illuminated. 2 – Press and hold the key that does not work properly. The remote control will auto try a new code every 1 sec. 3 – When the TV responds correctly then release the key. 4 – Then press OK to save the current setting. Some remote codes may not work with certain configurations such as cable TV remote model or sat TV remote. If this is the case, you can program an unsupported device (such as a sound bar) by setting each key individually to send a code. This means each button or key on your remote will need to be programmed for the remote to work. Each remote function works by sending a code to sound bar. This is done by setting AUX to a main device code and then setting things like volume up and down individually. The code 00169 will make the volume go up. The code 00168 will make the volume go down. The code 00037 will toggle the mute. The code 00165 will turn the power on and off. If you use Comcast, here is a way to make the remote work with the SB. 1 – Check to see if the signals work by assigning 20752 to the AUX button. 2 – Vol DOWN should make the volume go down, and the right arrow should make it go up. 3 – If the signals work then you can permanently assign the EFC 00169 to Vol UP and 00168 to Vol DOWN by using the 994 Command. 1 – Program the Vizio sound bar to “TV” key on the Uverse remote using code 1009. 2 – Program your TV to the “DVD” key on remote using manual code or auto scan mode. 3 – Send volume to TV button, press ATT then press OK, then enter 955, then press TV button. 4 – If you want to power all off at once, press ATT and OK buttons, release, enter 977, press ATT again, then press DVD and TV buttons, then the ENTER button. When you press volume the sound bar will operate, then when you press power everything should power off or on. Need more help programming your Universal or CAB SAT remote to your VIZIO soundbar? Please leave your questions below and we will be happy to assist. We have the Model sb2920-c6 vizio sound bar which is working fine. I have been unable to program our Dish Network Remote (model 54.0 the Hopper) to control volume, mute off/on. I have gone through the Dish process and have also input the 4 codes provided (1517, 0660, 0883) which were called invalid. There is no place to input the 5 digit codes. Dish is saying the remote is not compatible with the sound bar. Does anyone have any additional information? Current as of 26 Dec 2017. 3 digit code for TWC/Spectrum CLIKR-5 universal remote with VIZIO soundbar model SB3251n-E0 is 665. Soundbar purchased from Walmart. It used to work for the volume in my Vizio sound bar, but when I got a new TV it stopped working and I don’t know how to get it to work with the cable remote again! Help! I need to work a Vizio SB382 SoundBar with a Radio Shack 8 in 1 remote. 32454, 31975, 11144 displays “Invalid”. I just purchased a VIZIO Soundbar SB3621n. I would like to control it with my Xfinity XI voice remote. Looking for code to sync Vizio soundbar SB3651-E6 to an Infinity remote RC1475505/02SB. I have a Vizio SB38211-D6 Soundbar I’d like to pair with a Verizon FIOS Philips RC1445302 remote. None of the codes work. My direct TV remote operated the volume on my old soundbar but I am not able to get it to work on a new Vizio soundbar. the old soundbar was connected to the tv with the analog cables on AV1. the new soundbar is connected with the digital optical cable. In trying to program the remote the only options are AV1 and AV2 and TV. There isnt an option for optical. if you can be of any assistance in figuring this out it would be greatly appreciated! Are you able to help us connect a Toshiba CT-90302 remote for Vizio S3820w-C0 sound bar? It would be deeply appreciated. How do I control my Vizio SB3851DO with my Directv remote RC73. My TV is Samsung 6 Series Model UN55KU6300F. I have a vizio sb381 and xfinity/comcast universal remote (dark grey w/ red ok button). The 11144 code works for turning soundbar on and off, but not controlling volume. The 20752 code works for volume up with right arrow, but not volume down with any button. Any advice would be appreciated. I have a Vizio SB2920-D6 sound bar that I am trying to get to work with my AUX on my Clikr5 Time Warner Cable remote. I cannot find Vizio listed on their AUX Audio or home theater codes and all codes I find online are 4 or 5 digit and ALL Clikr5 codes are 3 digit. How do i program a Toshiba ct-90302 tv remote to control a Vizio sb2920-d6 soundbar. Tv is model 40RV525R. I have a Vizio SS2520-C6 Sound Stand and a URC-8820-MOTO remote control on Cox’s network, need a 4 digit Vizio code. I have the same remote and sound bar. Did you find a code that worked? I have a Vizio soundbar model S3820w-C0 and a Titan remote 2056-CXX. I cannot find the appropriate code number that will work on my remote. I have a vizio model SB2920-D6 soundbar. I am trying to get it to work with my time warner cable remote. I don’t know the brand or model number for the remote but it has the code RC122 on the back. I have tried the codes for the vizio soundbars and none of them seem to work. Have you found the code? I have the same sound bar and cable remote. I have a Vizio sound bar with remote subwoofer model number SB3812 – S 6. I am trying to make it work with an ATT U-verse is S 10 – S3 remote control. I’ve tried everything but cannot get it to operate the sound bar. I cannot find a code to get my Channel Master Enhanced Remote to control my Vizio Sound Bar Model SB4051-C0. It will turn the Samsung Smart TV on and off, but I would like to be able to turn the soundbar on and off and control the volume with the same remote. I have a GE universal remote with a 3820 soundbar. The remote does everything but turn it off. I have a Vizio SB 3821 – C6 with a Uverse S10-S4 remote – I am able to adjust the volume and turn the SB on but am unable to turn the soundbar off. Any thoughts? How did you program U-verse remote to control Vizio soundbar? My remote is a GE Universal Remote Model 10352, my sound bar is VIZIO S3821w. None of the codes work. Any ideas? Thank you. The most generic GE Universal remote codes for Vizio Sound Bars, including the model S3821w, will be codes 0660, 1517, 0883, and 31517. Try them and please let us know if one of the codes worked.